with thorns, your only crown. and blessing you have known! I claim you as my own. but yours the deadly pain. outlive my love to you. Deeply devotional, the text makes a very personal application of Christ's atoning death (st. 1-2) and confesses our gratitude and commitment to Christ (st. 3). struck down by God and afflicted. Today we remember Jesus was crucified. He suffered and died for our iniquities. because his death gives us life and brings redemption to the world. Let us worship our Savior. 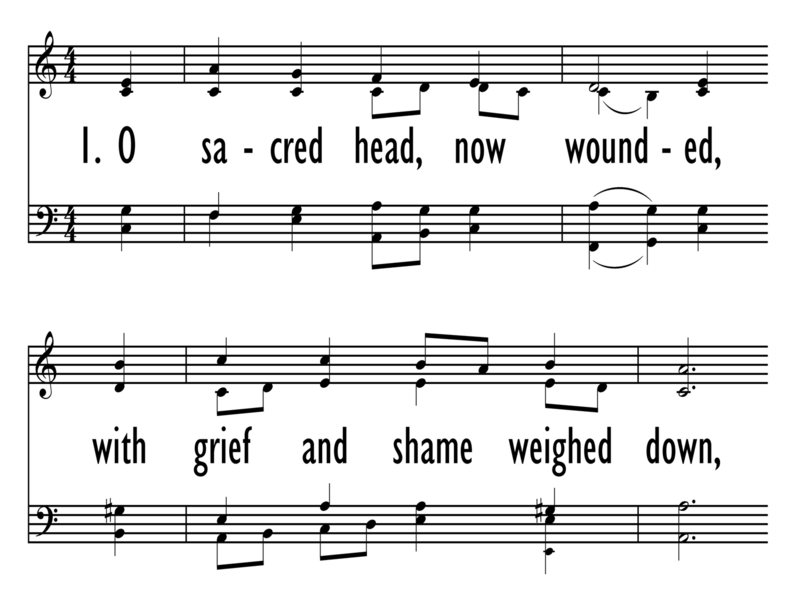 The next chorale is a Lenten one, taken from Bach’s Cantata 161, “Herzlich tut mich verlangen,” and found in most hymnals by the title “O Sacred Head, Now Wounded.” Here too the closing movement of the cantata is a chorale with an instrumental descant. Bach asks for a flute to play the flowing melody, mostly in 16th notes, above the chorale. 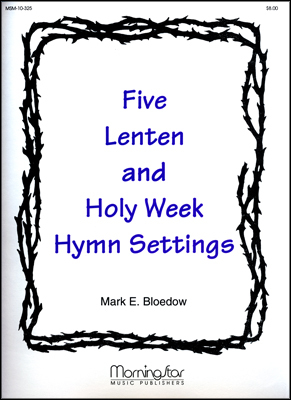 The tempo should not be fast for this best known of Lenten hymns, with its deeply felt sorrow and grief at the suffering of Jesus. The text for the stanza with Bach’s descant, however, deals with the transformation of earthly life into eternal life, when the righteous shall shine like the sun (“leuchten als die Sonne”). The theme is one of comfort rather than despair and sorrow, but it is a comfort based on the memory of the price paid for it—Jesus’ suffering and death. The radiant sound of the flute obbligato poignantly expresses the longing and hope for the reality of eternal life. Stanza 1: congregation (unison), choir (SATB), organ. Decide whether the tempo should be the same as for the cantata setting to come, or whether the tempo will slow down for the cantata setting. Stanza 3: using the Cantata 161 setting, with choir (SATB), flute descant, organ. Take care to set an appropriate tempo for this movement if different from the first two stanzas. Originally from a Latin poem beginning "Salve mundi salutare" and attributed to either Bernard of Clairvaux (twelfth century) or Arnulf von Loewen (1200-1251), "O Sacred Head" is one of seven sections to be used for meditation during Holy Week. Each section focuses on one aspect of Christ's dying body. Paul Gerhardt translated the seventh section ("Salve caput cruenta­turn"), which addresses Christ's head, into German ("O Haupt voll Blut und Wunden"). His ten-stanza translation was published in Johann Crüger's Praxis Pietatis Melica (1656). The English translation is mainly the work of James W. Alexander. It was published in Joshua Leavitt's The Christian Lyre (1830) and revised by Henry W. Baker for Hymns Ancient and Modern (1861). "O Sacred Head" has enjoyed great popularity since 1656; the hymn appears in all modern hymnals, in many languages and translations, and with various numbers of stanzas. Deeply devotional, the text makes a very personal application of Christ's atoning death (st. 1-2) and confesses our gratitude and commitment to Christ (st. 3). The tune HERZLICH TUT MICH VERLANGEN has been associated with Gerhardt's text since they were first published together in 1656. The tune's first association with a sacred text was its attachment in 1613 to Christoph Knoll's funeral text "Herzlich tut mich verlangen" (hence the tune name). It was originally a court song by the great Renaissance composer Hans Leo Hassler, published in his Lustgarten neuer teutscher Gesäng (1601). HERZLICH TUT MICH VERLANGEN (also known as ACH HERR, MICH ARMEN SUNDER, and PASSION CHORALE) is a bar form tune (AAB) with a glorious melody whose beauty has done much to fit the private devotional text onto the lips of congregations. Sing stanzas 1 and 3 in unison and stanza 2 in harmony (possibly unaccompanied with a confident congregation or choir). Keep a subdued registration on the organ and always accompany at a sustained pace. Paul Gerhardt (b. GraEenhainichen, Saxony, Germany, 1607; d. Lubben, Germany, 1676), famous author of Lutheran evangelical hymns, studied theology and hymnody at the University of Wittenberg and then was a tutor in Berlin, where he became friends with Johann Crüger. He served the Lutheran parish of Mittenwalde near Berlin (1651-1657) and the great St. Nicholas' Church in Berlin (1657-1666). Friederich William, the Calvinist elector, had issued an edict that forbade the various Protestant groups to fight each other. Although Gerhardt did not want strife between the churches, he refused to comply with the edict because he thought it opposed the Lutheran "Formula of Concord," which con­demned some Calvinist doctrines. Consequently, he was released from his position in Berlin in 1666. With the support of friends he became archdeacon at Lubben in 1669 and remained there until his death. Gerhardt experienced much suffering in his life­ he and his parishioners lived in the era of the Thirty Years' War, and his family experi­enced incredible tragedy: four of his five children died young, and his wife died after a prolonged illness. In the history of hymnody Gerhardt is considered a transitional figure-he wrote at a time when hymns were changing from a more objective, confes­sional, and corporate focus to a pietistic, devotional, and personal one. Like other German hymns, Gerhardt's were lengthy and intended for use throughout a service, a group of stanzas at a time. More than 130 of his hymns were published in various editions of Cruger's Praxis Pietatis Melica, the Crüger-Runge Gesangbuch (1653), and Ebeling's Das andere Dutzeud geistliche Andachtslieder Herrn Paul Gerhardts (1666-1667). John Wesley and Catherine Winkworth both made famous English translations of Gerhardt's texts. James W. Alexander (b. Hopewell, Louisa County, VA, 1804; d. Sweetsprings, VA, 1859) was often overshadowed by his father, the renowned Archibald Alexander, first professor at Princeton Theological Seminary. But James Alexander was also a fine preacher, teacher, and writer. He studied at New Jersey College (now Princeton University) and Princeton Seminary. Ordained in the Presbyterian Church, he alternated his career between teaching and pastoring; for two years (1849-1851) he was professor of ecclesiastical history and church government at Princeton Seminary. Alexander translated a number of hymns from Greek, Latin, and German but is mainly known today for his translation of "O Sacred Head." Hans Leo Hassler (b. Nuremberg, Germany, 1564; d. Frankfurt, Germany, 1612) came from a family of famous musicians. He received his early education from his father in Nuremberg, then studied in Venice with Andrea Gabrieli and became friends with Giovanni Gabrieli. In Venice he learned the polychoral style, for which the Gabrielis were justly famous, and brought this practice back with him to Germany. Hassler served as organist and composer for Octavian Fugger, the princely art patron of Augsburg (1585-1601), as director of town music and organist in the Frauenkirche in Nuremberg (1601-1608), and finally as court musician for the Elector of Saxony in Dresden (1608-1612). 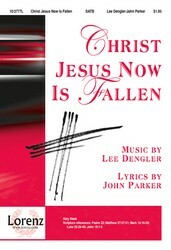 A Lutheran, Hassler composed for both the Roman Catholic liturgy and for Lutheran churches. Among his many works are two volumes of motets (1591, 1601), a famous collection of court songs, Lustgarten neuer Deutscher Gesang (1601), chorale motets, Psalmen und christliche Gesänge (1607), and a volume of simpler hymn settings, Kirchengesänge, Psalmen und geistliche Lieder (1608). This hymn text is often attributed to Bernard of Clairvaux, a French abbot and founder of the Cistercian Order in the early twelfth century. In certain medieval orders, monks would spend hours meditating upon the crucifix. They would mentally divide the body of Christ into parts and meditate on each part respectively. Bernard (some think it was medieval poet Arnulf of Louvain) wrote a poem of fifty lines for each part of Christ’s body - his feet, hands, side, breast, heart, and head, and called it, “A rhythmic prayer to any one of the members of Christ suffering and hanging on the Cross.” Bernard’s prayer to Christ’s head was the text hymnist Paul Gerhardt translated into German in the seventeenth century, and from which we have the English translation, “O Sacred Head, Now Wounded.” Just as Bernard would meditate on the crucifix, so too does this text call us to remember the wounded and broken body of Christ as he suffered for us. It is not an activity we can ever particularly enjoy doing, but in the midst of reflecting on this in sorrow, we find buried, beneath our grief and shame, a pearl of joy; we can call this Savior, “though despised and gory,” our own. He suffered because of his love for us; we remember because of our love for him.